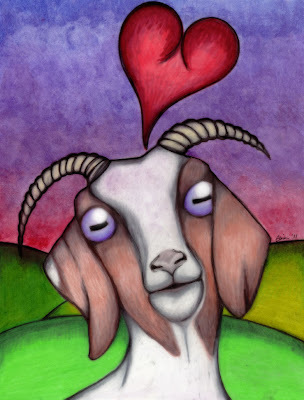 I have a begun a series of illustrations that will be donated to the For the Animals Sanctuary in Blairstown, NJ. My dear friend, Debbie Kowalski, who owns the Sanctuary also creates beautiful jewelery to help raise money for all the amazing animals who have been adopted. Sometime in the near future these illustrations will be made into jewelry (and perhaps other items) and the originals will be auctioned off to benefit the animals. Here is the first in the series which I completed yesterday....Meet Alice!